It's a new year here at Tower Site of the Week, and a new set of travel pictures to start us off. 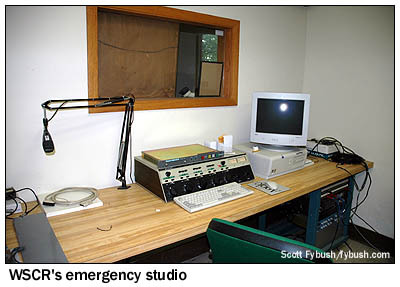 In August 2007, your editor and Mrs. Editor spent a few days traveling from her native Fort Wayne to Chicago, Milwaukee, Madison and then back to Fort Wayne via Rockford, Illinois, and along the way we had a chance to see some very significant broadcast sites. In particular, we had a very productive afternoon on the west side of Chicago, visiting three historic and important 50 kW AM sites that we're honored to be able to share with you over the next few weeks. In our last installment, we visited the Itasca transmitter site of CBS Radio's WBBM (780). This week's installment finds us about three miles away and 110 kHz down the dial at a station that was once a fierce rival of WBBM - and is now a sister station. We knew the basic history of this site on Army Trail Road in Bloomingdale, just west of the I-355 tollway - that it was the longtime home of WMAQ (670), NBC's Chicago outlet, transferring to Westinghouse hands with the 1988 sale of NBC Radio and then to CBS almost a decade later, as Westinghouse absorbed CBS and longtime rivalries like that of WMAQ and WBBM (or WCBS/WINS, or KNX/KFWB) turned into partnerships. 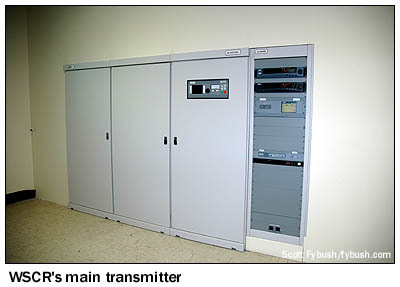 And of course we remembered that night in 2000 when the WMAQ calls left the Chicago radio dial for good, as CBS moved its all-sports WSCR down the dial from 1160 to this big 50 kilowatt nondirectional class I-A clear channel signal. 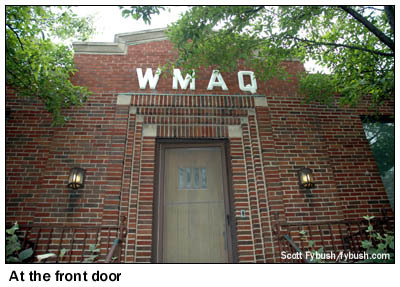 But here's what we didn't know: this wasn't WMAQ's original site - and when WMAQ moved here in 1935, the site already had a broadcast pedigree. It turns out that 63 years before Westinghouse bought this site from NBC, NBC had purchased it - for just a dollar - from...Westinghouse! For this very building was the transmitter site of Westinghouse's KYW, Chicago's pioneering radio station, which had been operating from transmitter sites within the city from its 1921 sign-on until its 1929 move to this site way out in the country. For all its pioneer status, though, KYW had to fight to retain its spot at 1020 on the dial after the "Davis amendment," which divided the country into five broadcast zones, allocated that spot to a different part of the country. Several other stations that were already operating in the designated region, including WWJ in Detroit, WCAU, WIP and WFAN in Philadelphia and WJAS in Pittsburgh all applied for 1020, and to defend its frequency, Westinghouse eventually had to move KYW out of Chicago. So on December 3, 1934, Westinghouse pulled up stakes and moved KYW to Philadelphia, building the transmitter site in Whitemarsh Township, PA that the station calls home to this day. 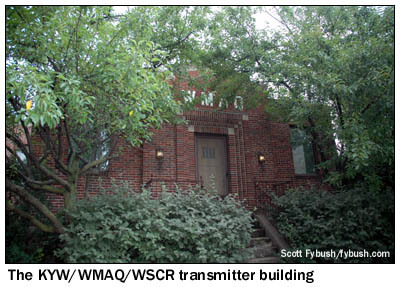 WMAQ, which had been operating from a transmitter site a few miles to the east in Elmhurst, IL, abandoned that location and took over this site. For the privilege, NBC paid Westinghouse all of one dollar! Anyone entering the brick transmitter building back then would have been greeted by pretty much the same thing that greets visitors, few as they may be, today: a heavy wooden front door that leads into a hallway with offices on both sides. 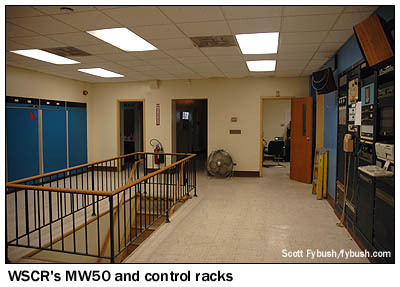 That hallway, in turn, leads to the big main transmitter room, which would once have been filled by the big Westinghouse transmitter. 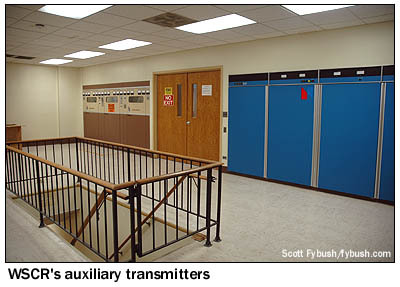 In 1960, the Westinghouse gave way to a RCA BTA-50H Ampliphase transmitter, and in 2006 the space once filled by the Ampliphase, off to the side of the main transmitter room, was in turn filled (well, partially occupied, anyway) by the station's current main transmitter, a Harris 3DX50 Destiny. In the meantime, the three other transmitters that are still in the building had taken up residence around the room: a 5 kW RCA BTA-5R1 that came in with the Ampliphase in 1960 still sits across from the 3DX50, used only rarely as a last-resort auxiliary tramsmitter. Over in the main room, across that stairwell that splits the room in half, there's a Harris MW-50B that came here in 1978 (it still sports the period-correct NBC "N" on one of its cabinet doors!) and the Continental 317C3 that came here in 1984, near the end of NBC's ownership. While there were never engineers living full-time at this site, there are kitchen and shower facilities on the main floor here as well. 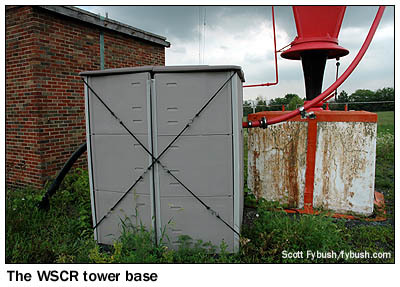 Getting the FM signal across the insulated base of the tower requires an isocoupler, and the WLEY isocoupler resides in an interesting housing: a rubber storage shed that sits at the base of the tower! If the current 670 tower seems a little less massive than one might expect to see at such a venerable site, there's a reason for that: it's not quite as old as the rest of this site. WMAQ's original vertical tower collapsed in 1949, and while it was removed and rebuilt, NBC found an unusual way to get the station back on the air at high power. The answer turned out to be a tower that RCA had in storage at its shortwave transmitter site near Bound Brook, New Jersey. This 250-foot self-supporting tower had been one of the support structures for the horizontal wire antenna at WTAM in Cleveland. And when that antenna was replaced by a vertical tower - the same one, if I'm not mistaken, that WTAM still uses at its site in Brecksville, Ohio - RCA then reused the tower as part of its display at the 1939 New York World's Fair, where it rose impressively, if only for show, above the RCA Exhibition Building to proclaim the impending wonders of television. When the fair ended, the tower was dismantled and shipped to New Jersey, where it was ready for a quick train ride to Chicago to be pressed into service as an emergency antenna for WMAQ. When the emergency had passed and the new tower was standing tall, the shorter tower remained in place, and there it stands to this day, full of history that almost nobody knows. Thanks to WSCR chief engineer Greg Davis for the tour!